An aquarium driven by a deep respect and love for our oceans, Birch Aquarium promotes conservation through education and research. Birch Aquarium at Scripps brings ocean life to the surface with hands-on exhibits and a fascinating collection of sea creatures. Located in La Jolla, California, Birch Aquarium serves as the public exploration center for Scripps Institution of Oceanography at University of California San Diego. Drawing more than 460,000 visitors each year, Birch Aquarium entertains and educates the community with their conservation-driven mission and beautifully designed animal habitats. Birch Aquarium and Motionstrand collaborated in 2016, to assist the Aquarium with their organic and paid social media efforts. Motionstrand’s social media strategy for Birch Aquarium focused on consistency, creating engaging content, and building a targeted audience. 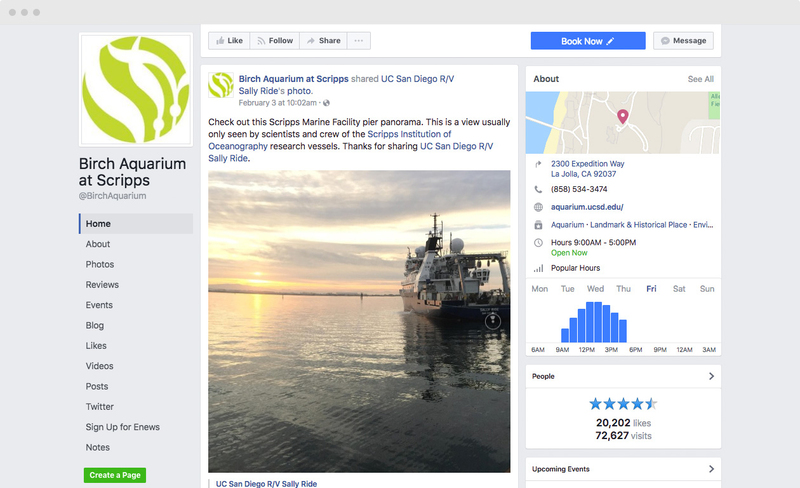 Motionstrand improved Birch Aquarium’s social media presence through two tactics: strategic targeting on Facebook’s advertising platform and a comprehensive editorial calendar. Motionstrand established a consistent schedule and assisted with content creation, giving Birch Aquarium a more cohesive voice and presence on social media. 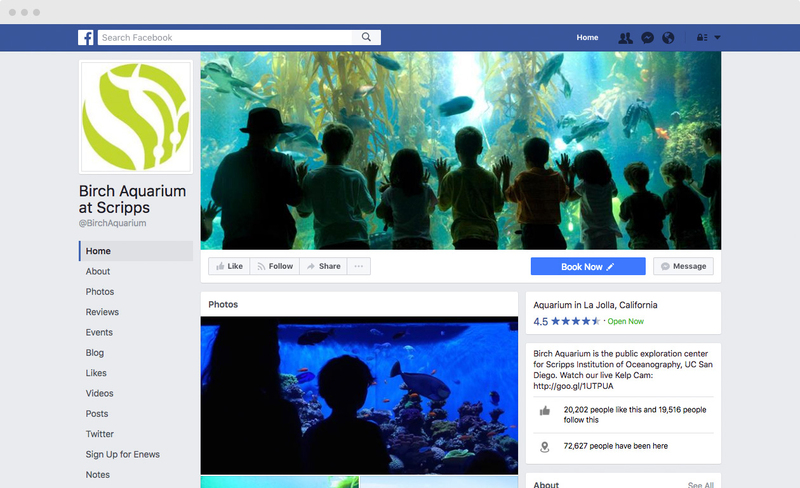 Facebook advertisements for the Aquarium were micro-targeted; we refined our audience through pinpointing users by location, in addition to targeting users with relevant interests that fit Birch Aquarium’s core demographic. 60 diverse habitats hold more than 4,000 sea creatures from all over the world. Birch Aquarium takes visitors on a journey through our world's oceans, from the local kelp forests of San Diego Bay to the coral reefs of the Indo-Pacific. In less than five months, Birch Aquarium’s Facebook page saw significant growth for several key metrics, including engagement and page likes. From July 2016 to December 2016, Birch Aquarium had a 20% increase in Facebook Page Likes. Birch Aquarium's engagement on Facebook increased by 80%. The most notable increase was seen in Birch Aquarium’s reach, or the number of users that received an ad impression, which saw an overall increase of 109%. Birch Aquarium's organic reach increased by 90% and their paid reach increased by 117%. No trip to San Diego is complete without a stop at Birch Aquarium. Take a deep dive into San Diego’s underwater world and get to know the locals you won’t see anywhere else. Get hands-on at our Tide-Pool Plaza, where you can touch sea stars, sea anemones, and more. Tickets are available online, plan your visit today. Birch Aquarium's mission is to provide ocean science education to inspire guests to protect and preserve the planet. As the public outreach center for renowned Scripps Institution of Oceanography, UC San Diego, we introduce guests to the cutting edge science happening under, within, and above the world's oceans.